Irene Roberts as Carmen. Photo by Cory Weaver. Acclaimed/dreaded Spanish director Calixto Bieito made his American debut tonight with a surprisingly mild-mannered San Francisco Opera production of Bizet’s Carmen. 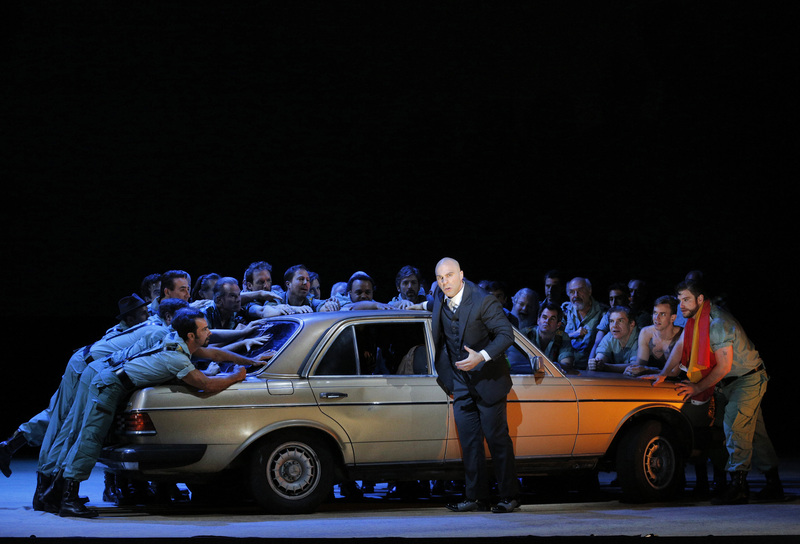 Since first directing Carmen at a Catalan festival 17 years ago, Bieito went on to become the very definition of Eurotrash, with violent, scatological, outrageous productions all over Europe — most well received by large segments of the audience. When SFO General Director David Gockley, retiring this summer after an illustrious four-decade leadership in opera, announced the coming of this production, he said it would be without the excesses Bieito is known for — and he was right. Staging the work here is Joan Anton Rechi, a longtime Bieito collaborator, involved with Carmen since before the original 1999 production. Ellie Dehn as Micaëla and Brian Jadge as Don Jose. Photo by Cory Weaver. The first priority is to acknowledge tonight’s vocal-musical excellence. Conducted brilliantly by the debuting Carlo Montanaro, an Italian conductor whose last position was in Warsaw, and featuring Ian Robertson’s SFO Chorus at its singing and athletic best, tonight’s performance was all virtually flawless. Under Montanaro’s direction, the music was consistently alive and yet disciplined so as to avoid the circus-music fortissimos heard in some Carmen performances. 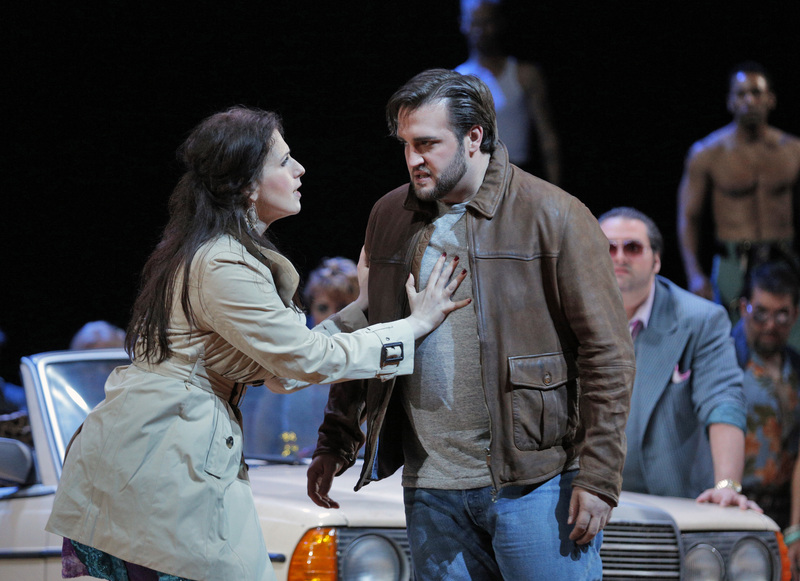 Irene Roberts, in the title role, and San Francisco Merola/Adler alumn Brian Jagde as Don José, sang big and acted with passion. Ellie Dehn was perhaps the best Micaëla in recent memory. Zachary Nelson’s debut in the role of Escamillo was impressive. Two young singers, Amina Edris (debut) and Renée Rapier, appeared as Frasquita and Mercédes, heading a large group of current and past Merola/Adler singers in comprimario roles. There are two casts, with leading roles alternating. Besides some minor shtick — Don José and Micaëla taking a selfie of themselves, some men appearing naked to the waist, with one of them running in circles through the entire first scene — the production is straightforward and largely serving the work, perhaps with more attention than usual to Mérimée’s novella that served as Bizet’s source material. Alfons Flores is credited for the sets — of which there are almost none. The stage is virtually bare in every act: there is a flagpole in the first act, a car or two in the others, then a big billboard of a bull (an advertisement for Soberano brandy), and that’s pretty much it. The mystery is why so much is made in the program and in promotional materials about setting the opera in the North African city of Ceuta. Given what you see (the empty stage), it may just as well be Cordoba or Death Valley. Zachary Nelson as Escamillo. Photo by Cory Weaver. Janos Gereben is a writer and columnist for SF Classical Voice. He has worked as writer and editor with the NY Herald-Tribune, TIME Inc., UPI, Honolulu Star-Bulletin, San Jose Mercury News, Post Newspaper Group, and wrote documentation for various technology companies. Irene Roberts as Carmen, Brian Jagde as Don Jose. Photo by Cory Weaver.